"If you want to know the history of the San Fernando Valley, read the street signs." AMESTOY AVENUE: Was named after Domingo Amestoy, one of the largest wool producers in Southern California. In 1889 he acquired all 4,500 acres of Rancho Los Encinos in the San Fernando Valley. Louise Avenue was named after Louise Amestoy, a daughter of Domingo and Marie Amestoy. BARHAM BOULEVARD: Was named for Frank Barham, a newspaper magnate and L.A. booster who donated the land that later became Barham Boulevard. He was partners in a publishing business with William Randolph Hearst (The Herald Examiner). BRAND BOULEVARD: Named for Leslie Brand, a street car magnate and developer who lived in the Glendale area. He subdivided Mission Hills and connected it to Los Angeles with a street car line. Today's Brand Boulevard follows the route of his car line. BURBANK BOULEVARD: After the city of Burbank, which was named after David Burbank who owned much of the land where the city now sits. CAHUENGA BOULEVARD: Named after Cahuenga Pass which has long been a convenient shortcut between the San Fernando Valley and Los Angeles Basin. The first Southern Californians likely blazed a foot-trail millennia ago, and by the late 18th century the villagers of Cabueg-na or Kaweenga (the origin of the name "Cahuenga") near Universal Studios regularly trekked through the pass. In 1852, a steep wagon road replaced the old trail, and in 1911 the Pacific Electric stretched its interurban railway tracks through the pass. Any remnants of the pass' rustic character vanished in 1940, when the Cahuenga Pass Freeway -- one of L.A.'s first – opened. CHANDLER BOULEVARD: Was originally a leg of Sherman Way, it was renamed for land developer and Los Angeles Times publisher Harry Chandler. His father-in-law was Harrison Gray Otis, owner of the LA Times, for which Otis Street was named after. CHATSWORTH STREET: Chatsworth Street ran all the way to the town of Chatsworth Park located at the west end of the San Fernando Valley. The name came from Chatsworth House, the family seat of the Duke of Devonshire in Derbyshire, United Kingdom. The Devonshire name was also used for the naming of the major east-west boulevard. The western portion of Chatsworth Street used to be known as Ben Porter Avenue, for the owner of the rancho across whose land the road passed. For a time, the portion near Zelzah Avenue was named Santa Susana Pass Road. COLDWATER CANYON AVENUE: Named after Coldwater Canyon, the stretch of it in the Valley was Diaz Avenue until 1937. CORBIN AVENUE: Named after W. H. Corbin who was a Valley grain dealer. DE CELIS PLACE: Named after Eulogio de Celis, who in 1846 was the recipient of a Mexican 116,858-acre land grant (Rancho Ex-Mission San Fernando) given to him by Governor Pío Pico. In 1874, after the death of Eulogio de Celis, the family sold their northern half of Rancho Ex-Mission San Fernando to northern Californians, California State Senator Charles Maclay and his partners George K. Porter and his brother, Benjamin F. Porter. DEVONSHIRE STREET: After the English County, the family seat of the Duke of Devonshire in Derbyshire, United Kingdom. FULTON AVENUE: Named for Walter M. Fulton, a local resident in 1917. HARDING AVENUE and HARDING STREET: Henry Harding was the original surveyor for the original subdivision in the city of San Fernando. He actually got two streets named for him: Harding Avenue and Harding Street in San Fernando. HARPS STREET: Named for Jacob Harps. He was actually the first builder in San Fernando, the city of San Fernando. HARTSOOK STREET and HESBY STREET: There's a Hesby Street in Studio City, close by where the 101 and 405 meet. Two blocks from Hesby, there's a Hartsook Street. And therein lies a love story. Fred Hartsook was a photographer and rancher near the town of Lankershim. Before Lankershim became North Hollywood and before Fred Hartsook became a rancher, he was an itinerant shutterbug. Hartsook wandered all over the state, his team of mules pulling a homemade darkroom. Hartsook eventually had 30 photography studios in California. In San Francisco, he met the love of his life: Bess Hesby. In 1915, she was crowned the Queen of the Pan Pacific Exposition. Their honeymoon cabin in the redwoods of Humboldt County became the Hartsook Inn, where Mary Pickford, Bing Crosby and other luminaries were among the visitors. But Fred and Bess spent much of their married life in the San Fernando Valley, not far from the streets that now carry their names: Hesby and Hartsook. HAYVENHURST AVENUE: There isn't a person named "Hayvenhurst" – but there is a "Hay." Hayvenhurst Avenue and Hayvenhurst mansion are named for the same man. Hayvenhurst was the estate of Encino subdivider William Hamilton Hay. William Hamilton was better known as realtor "Billy Hay." He drew the streets and carved out the subdivisions in the early days of Encino. In the 1970s, a musical family moved from Gary, Indiana to Encino, bought a mansion on a five-acre lot, and called it Hayvenhurst. The Jackson children, including Michael and Janet, grew up there. A replica of Michael's star on the Hollywood Walk of Fame is outside the front door. His parents still live in the house. Papa Joe Jackson has started a clothing company called Hayvenhurst, further spreading the fame of that early Encino real estate tycoon. HAZELTINE STREET: Hazeltine is both the middle name of General Moses Hazeltine Sherman, and the name of his daughter. Most sources agree the street was named by the General in honor of his daughter. His first and middle names, according to one unreliable source, came from a man his aunt married named Moses Hazeltine. JOUETT STREET: Named for Jouett Allen, a lawyer-turned-developer from Chattanooga, Tennessee, purchased 1,000 acres of undeveloped land that was located adjacent to the Southern Pacific Railroad tracks and just south of San Fernando. The property was subsequently divided in half: 500 acres were retained by Allen, and the other 500 acres were subdivided and platted to make way for the construction of a new town along the railroad line. Allen named the town Pacoima. KESTER AVENUE: Named for Kester Ranch, a major wheat-growing concern—part of the Lankershim-Van Nuys empire—from the 1870s to 1909. KNAPP STREET: Named for the Knapp Family, stone builders who did much of the work at Orcutt Ranch in the West San Fernando Valley. Knapp Ranch Park was also named for this family. LANGDON AVENUE: Named after Dr. Frederick Langdon, a dentist by training, who was a Los Angeles city councilman from 1911 to 1923. LANKERSHIM BOULEVARD: Named for the town of Lankershim (first called Toluca, now North Hollywood) and its founding family. Isaac B. Lankershim grew wheat on a wide swath of the Valley floor on his Lankershim Ranch. North Hollywood was established by the Lankershim Ranch Land and Water Company in 1887. It was first named Toluca before being renamed Lankershim in 1896 and finally North Hollywood in 1927. LAS VIRGENES ROAD: Named after El Rancho de Nuestra la Reina de Las Virgenes in Calabasas. That translates as "the ranch of our Lady of the Virgins." LEDERER AVENUE: Named for Francis Lederer, a Czech-born film and stage actor with a successful career, first in Europe, then in the United States. He has more than seventy credits on the IMDb. Lederer served as Recreation and Parks Commissioner for the city of Los Angeles, received awards for his efforts to beautify the city and was also the Honorary Mayor of Canoga Park during a good portion of his life prior to his death in 2000 at the age of 100. LOUISE AVENUE: Was named after Louise Amestoy, a daughter of Domingo and Marie Amestoy. Domingo Amestoy was one of the largest wool producers in Southern California. In 1889 he acquired all 4,500 acres of Rancho Los Encinos in the San Fernando Valley. Amestoy Avenue is named after Domingo Amestoy. MACLAY STREET: Named after Charles Maclay, California State Senator and Founder of the city of San Fernando. MASON AVENUE: Was named for Azubeth H. Mason in 1917. MATALIJA AVENUE: Named for a Chumash Indian rancheria in Ventura County, and is Chumash for poppy. MAYALL STREET: Was named in 1924 after the surveyor Robert Mayall. MONOGRAM AVENUE: Named for the Monogram homebuilders that were one of the major developers in the Valley boom right after World War II. MOORPARK STREET: Moorparks are an English variety of apricot, a popular crop in early North Hollywood. Name changed from Second Street in 1917. The 'Moorpark' variety itself was named after the Moor Park estate in England where this apricot was first cultivated in the 1600s. MULHOLLAND DRIVE: Named for the legendary engineer William Mulholland, who designed the vast Los Angeles Aqueduct, as well as the Mulholland Dam and Lake Hollywood above Hollywood. This winding ridgeline road in the Santa Monica Mountains was originally a dirt road and first called Mulholland Highway before being renamed Mulholland Drive in 1939. Portions of the original road remain unpaved to this day. NORDHOFF STREET: Was named for famed 19th-century health seeker and writer Charles Nordhoff. Hired by Southern Pacific rail baron Henry Huntington in 1873, journalist Charles Nordhoff wrote the book California for Health, Pleasure and Residence. OTIS STREET: Was named after Harrison Gray Otis, owner of the LA Times. His son-in-law, Harry Chandler, also had a street named after him – Chandler Boulevard. OWENSMOUTH AVENUE: Named after 'Owensmouth', designed to evoke an image of being at the mouth of the distant Owens River and was the original name of the settlement that grew into the town of Canoga Park. OXNARD STREET: Named for Henry T. Oxnard, sugar beet magnate in the Ventura County area. The name dates from 1916, when the Valley was developing into a major beet producer. PARTHENIA STREET: Was named for Miss Parthenia Staton of Lafayette Park, California in 1916, when it opened between Van Nuys Boulevard and Kester Avenue. PAXTON AVENUE: Named after Paxton Maclay, wife of Charles Maclay, California State Senator and founder of the city of San Fernando. PETIT AVENUE: Stanley Norris Petit, known for his pioneering efforts in ranch operations and aviation in the San Fernando Valley, and his father William Justin Petit, owned and operated Encino Rancho, the largest single parcel of property in the Valley before the Sepulveda Basin and Birmingham Hospital (now Birmingham High School) were built. After subdividing the ranch, Petit Avenue--which runs across the Valley to Encino--was named for the elder Petit. PLATT AVENUE: Was named for George E. Platt, a Los Angeles dairyman that ran the Platt Ranch. PLUMMER STREET: Named for John Plummer, who owned a ranch along Sepulveda Boulevard. RAYMER STREET: Raymer was originally the name of a train station which opened in 1898 on the Southern Pacific rail line across the Valley. The train was vital for the San Fernando Valley's farmers and miners. Today, both freight trains and Metrolink travel those same tracks, just steps away from Raymer Street. RESEDA BOULEVARD: Named after a fragrant North African yellow-dye plant, Reseda odorata, whose English name is mignonette and which grows in hot, dry climates—replaced Marian as a designation for a stop on the Pacific Electric interurban railway running along Sherman Way. The name "Reseda" was given first to a siding on a branch of the Southern Pacific Railroad in the south San Fernando Valley. RINALDI STREET: Named after the ranch owner Karl R. Rinaldi. He was a citrus grower in the late 1890s in the Granada Hills and Mission Hills area. RIVERSIDE DRIVE: After the Los Angeles River. ROSCOE BOULEVARD: Derives from the town of Roscoe, now Sun Valley. The thoroughfare originated as a plowed furrow that extended the length of the Valley and marked the boundary between the Lankershim Ranch on the south and the Maclay-Porter ranches on the north. RUNNYMEDE STREET: Was named after Charles Weeks' first poultry farm in Northern California. Weeks created a small farming community named Weeks Poultry Colony in the Winnetka area of the San Fernando Valley. In 1934, that neighborhood was named Winnetka after Weeks' former hometown, Winnetka, Illinois. SAN FERNANDO MISSION BOULEVARD: Named after the Mission San Fernando Rey de Espana (San Fernando Mission). SANTA SUSANA PASS ROAD: Named for the mountain, Santa Susana, that the road passes through connecting the San Fernando Valley and town of Chatsworth, to the Simi Valley and city of Simi Valley. The name "Santa Susana" traces back to the Roman Empire and the Santa Susanna-church built in the 4th century, dedicated to Saint Susanna, a Roman Catholic saint that was martyred and beheaded in Rome in the 3rd century. SEPULVEDA BOULEVARD: The longest thoroughfare in both the city and county of Los Angeles, stretches 40 miles from Long Beach to Mission Hills in the San Fernando Valley. It was named in 1925 for pioneering 19th century cattle rancher Francisco Sepulveda, whose 30,260-acre spread, Rancho San Vicente y Santa Monica, extended west from the present-day boulevard to the ocean. It was originally named Saugus Boulevard in the San Fernando Valley, as late as the 1920s. SHERMAN WAY: Named for land developer General Moses Sherman who built the first electric railway across the San Fernando Valley. SHOUP AVENUE: Named after Paul Shoup, a vice president of the Southern Pacific Railroad and president of the Pacific Electric Railway Co.
TOPANGA CANYON BOULEVARD: The name 'Topanga' means 'above' with reference to the village site being above the high water of Topanga Creek. The 'nga' with which the name ends means 'place' and the entire name apparently means 'above place' or, as we would say in current English, merely 'above'. The name is an old Shoshonean word and can also be used in reference to the sky or heaven. VAN NUYS BOULEVARD: Named in honor of Isaac Newton Van Nuys (November 20, 1836 – February 12, 1912), a land developer, banker, and agricultural entrepreneur. 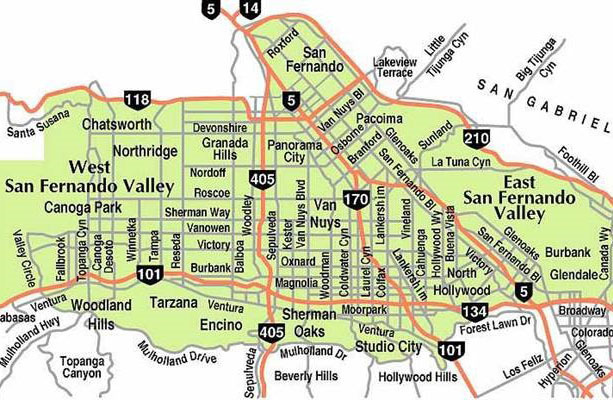 VANOWEN STREET: Coined because it was the direct route across the Valley between the towns of Van Nuys and Owensmouth. VENTURA BOULEVARD: The name Ventura is derived from Saint Bonaventure, for whom Father Junipero Serra named the Mission San Buenaventura, in what is now the city of Ventura. The 101 Freeway, constructed in 1959 along a route over the Conejo Grade, linked the city of Ventura with Los Angeles and was named the Ventura Freeway. Ventura Boulevard preceded the freeway, flowing all the way from the Cahuenga Pass west throuh the valley. It's the oldest continuously traveled route in the Valley. It was laid out to follow part of the Spanish El Camino Real, and was known first as Camino de las Virgenes, and then Ventura Road before becoming the famous thoroughfare we all know as Ventura Boulevard. VICTORY BOULEVARD: Named in honor of the Valley's World War I veterans in 1924. The segment west of Balboa Boulevard did not open until 1955. When Van Nuys was plotted in 1911, Victory Boulevard was called 7th Avenue. Around 1916, the name was changed to Leesdale Avenue. In the mid-1920s, the Leesdale Improvement Association unveiled plans to expand Leesdale Avenue as an 80-foot-wide "great east-and-west boulevard" through the Valley. At that time, the City also changed the name to Victory Boulevard, in honor of soldiers returning from World War I, and paved the boulevard as far west as Balboa Boulevard where it ended. Victory Boulevard did not extend to the West Valley until the 1950s. WEDDINGTON STREET: Named for the Weddingtons, a pioneer family in the town of Lankershim (now North Hollywood). Wilson C. Weddington was the postmaster of Lankershim for 22 years. He also bought a general store – and called it Weddington Brothers. In 1911, Postmaster Weddington helped drive the golden spike into the last set of tracks on the day the electric-powered Red Car rail line began service to the San Fernando Valley. Weddington was so respected in the community that when he died in 1923, the local business district shut its doors for an hour in his honor. WHITNALL HIGHWAY: Was named for Gordon Whitnall, L.A.'s Planning Director in the early 20th century. It's a divided street. Whitnall Highway has a north and a south and in between there this big plot of land which now has power lines going down. It was actually laid out to be like a beautiful parkway where people could utilize it. Unfortunately, the plan never happened. From 1913 until the Great Depression, Gordon Whitnall carved out his vision for a decentralized L.A. He didn't live long enough to see his dream for Whitnall Highway come true. WHITSETT AVENUE: Named after William P. Whitsett who is remembered by some as the "Father of Van Nuys." He was also a major land developer and water official in Los Angeles. The street was first known as Encino Avenue. WINNETKA AVENUE: Gets its name from the community of Winnetka. Charles Weeks created a small farming community named Weeks Poultry Colony in the Winnetka area of the San Fernando Valley. In 1934, that neighborhood was named Winnetka after Weeks' former hometown, Winnetka, Illinois. WOODLEY AVENUE: Named for Frank A. Woodley, a county supervisor and state legislator. Laid out as Alvarado Avenue north of Roscoe Boulevard in 1916. WOODMAN AVENUE: Named for the Woodman Ranch in 1917, after being called Castro Avenue. At the same time, the Mayor of Los Angeles was Frederick Thomas Woodman, who served from 1916 to 1919, leading many to conclude ever since the avenue was named in his honor. It wasn't. ZELZAH AVENUE: Was part of the 19th-century wagon route from San Fernando to the Hawk Ranch, which became the town of Zelzah (a Biblical name for "oasis," or "watering place in the desert"). In 1929 the name was changed to North Los Angeles. In 1938, the name changed again to Northridge Village and promptly shortened to Northridge.